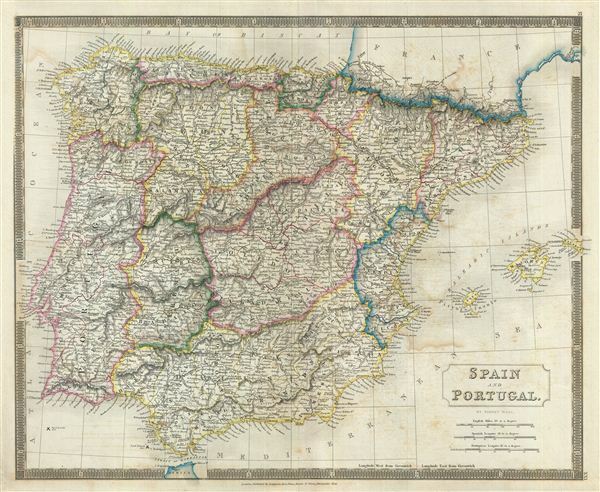 This is a beautiful map of Spain and Portugal from Sidney Hall's extremely scarce 1835 New General Atlas. It covers the entirety of Iberia including the Balearic Islands of Minorca, Majorca, and Ibiza. Both countries are covered in full, with Spain being divided into its various semi-autonomous provinces. The Strait of Gibraltar is also noted along with the Tangier in Africa. Several battlegrounds are identified, including the 1808 Battle of Vimeriro, the 1797 Battle of Cape St. Vincent (here noted as Sir J. Jervis), and of course the 1805 Battle of Trafalgar, among others. Towns, rivers, mountains, railroads, canals, marshes, forests, and various other important topographical details are noted. Elevation throughout is rendered by hachure and political and territorial boundaries are outlined in color. As this map was issued, Spain was in the midst of the First Carlist War. The death of Ferdinand VII saw his daughter, Isabella II, an infant at the time, proclaimed Queen with his wife, Maria Cristina, regent. Infante Carlos, Ferdinand's brother disputed Isabella's claim to the throne. This would eventually result in a civil war from 1833-1839. Meanwhile, in Portugal this map shortly follows on the War of the Two Brothers. In 1826, Peter IV of Portugal abdicated his throne in favor of his seven year old daughter Maria da Gloria, on the condition that she marry her uncle (Peter's brother) Miguel. Miguel deposed Maria and proclaimed himself king, leading to the Liberal Wars, and eventually in Miguel being forced to abdicate and go into exile. Maria da Gloria was proclaimed queen in 1834 and resumed her reign as Maria II of Portugal. Rumsey 4224.022 (1830 edition). Philips (Atlases) 758. Ristow, W., American Maps and Mapmakers: Commercial Cartography in the Nineteenth Century, p. 303-09.